1. Place the cider in a large glass bowl and stir in 2 tbsp of the maple syrup, the garlic cloves and half the thyme sprigs. Add the pork and leave to soak for at least an hour or overnight. 2. Lift out the pork, discarding the marinade. Thread the meat and vegetables alternately onto 8 skewers. Spray lightly with the oil. 3. Barbecue, grill or griddle the skewers for 15–20 minutes, turning regularly until cooked through. 4. Strip the leaves from the remaining thyme sprigs and stir into the remaining maple syrup. Brush onto the skewers and continue to cook for a further 5 minutes until shiny and nicely browned. 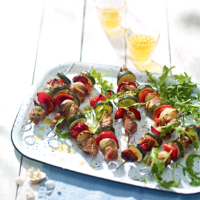 Serve with leafy salad and a chilled glass of the remaining cider. A metal skewer works best with meat as it helps to cook faster. for 30 minutes before using so they don’t burn on the grill.